In March 2012, the Bodleian Libraries were offered the project “Window on Korea” by the National Library of Korea. The project will provide the Bodleian Libraries up to 4000 volumes in the first year (2012) and 200 volumes per year during the next five years (2013 – 2017). In addition, the National Library of Korea also provides funding to help creating a Korean library with audio/visual room at the basement of the Oriental Institute Library. It offers the opportunity to expand the collection as well as bringing all necessary Korean materials (reference, newspapers, teaching, audio visual and research materials) into one location at the Oriental Institute where Korean courses are taught. The open ceremony was held on 21st June 2013. Please see article in the Publication section below. 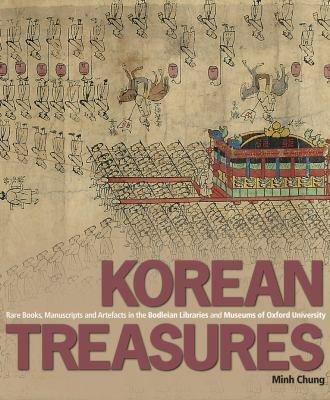 Korean treasures : rare books, manuscripts and artefacts in the Bodleian libraries and museums of Oxford University, Vol. 2. To be available in May 2019. Korean treasures : rare books, manuscripts and artefacts in the Bodleian libraries and museums of Oxford University. Available in the Korean Studies Library and the Bodleian Libraries. Number 8 (December 2012) p.111-115, respectively. 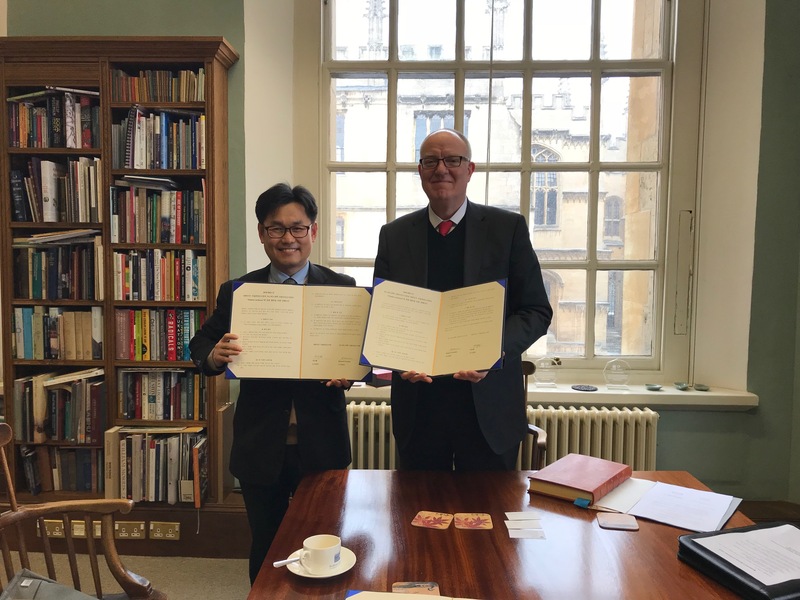 Development of Korean Studies and resources in Oxford. The Korean language collection started in the late 19th century and was built up in the 20th century. Previous Keepers of Oriental Books, such as Mr. Adrian Roberts and Ms. Lesley Forbes, began acquiring Korean books and supported the collection even before the University had degree programmes in Korean subjects. The Bodleian collection has been steadily growing in size and coverage into the 21st century. In 1990 it numbered 2,860 titles (approximately 5,000 volumes). It expanded to about 6,000 titles by 2000 and has now well in excess of 15,000 titles (approximately 35,000 volumes). In addition there are about 15,000 volumes in western languages as well as over 400 journal titles. Among the earliest accessions, a group of bibles translated into Hangul by John Ross, donated by Rev Solomon Ceasar Malan in 1885. Other significant donations came into the library sporadically between 1896 and 1930 from Bishop Mark Trollope, who first went to Korea in 1890, include two manuscripts, one of which is a painted procession of the funeral of King Yŏngjo (英祖1694–1776), along with a collection of sixteen to nineteenth century printed Korean texts. Generally speaking the collection has focused on the humanities, including Korean classical and modern literature and pre-modern history, but materials relating to the study of modern Korea are increasingly acquired. A particular strength is modern local histories of provinces and major Korean cities, including places in North Korea. Histories of important banking institutions, corporations and companies as well as family records and genealogies are also acquired as well as Japanese publications relating to Korean studies. Much of the collection has been built up by active solicitation of donations, particularly of publications not commercially available, for example local histories and Korean university journals. Material published in North Korea is sparsely represented, but the collection contains a fair number of works relating to the history, governance and economy of North Korea published in Seoul and elsewhere. The most recent notable acquisition is from Monsignor Richard Rutt. This gift is a large donation, which arrived at the library in October 2008. It is composed of about 2,000 items. The collection is the larger part of Rutt’s personal library and offers an impressive scholar’s collection. Other significant gifts include the gift of an important collection of recently published books and reproduced manuscripts (112 titles in 400 volumes) from the Kyujanggak Royal Library, presented by Dr Lee Jang-Moo, President of Seoul National University in 2009. More information is available on special collections relating to Korea. Much of the Korean material including works in Japanese is primarily held offsite and modern volumes may be ordered to most Bodleian Reading Rooms. Material on Korea required for teaching purposes is kept at the Korean Studies Library, Bodleian Oriental Institute. Those relating to Korean art and archaeology are housed in the Eastern Art collection at the Sackler Library. Korean manuscripts and antiquarian printed books are housed in the Weston Library. Western and Korean language works are catalogued on SOLO provides original script internet access to sources in Korean as well as western languages. <한국고전번역원> Hanguk kojon ponyokwon - Institute For the Translation of Korean Classic. Translations into modern Korean of classic Korean books originally written in Chinese. The producers are the highest calibre translators in South Korea and an agency underneath the Ministry of Education. Korean Wisdom - an online exhibit of six collections from the National Library of Korea's digitized holdings. KRpia - The Korean language database covers 600 publications in such fields as literature, economics, business, theology, law, administration, arts, engineering and natural science.It is a primary source reference database divided into ten topics and one hundred forty subcategories and includes special dictionaries, archival and historical resources, biographical sources, and other reference materials related to Korean history, literature, civilization and medicine.